Last year – on August 20 – The Mortal Instruments: City of Bones started shooting in Toronto, Canada and now 367 days later, the movie has hit the big screens in the United States, the United Kingdom and many other countries. 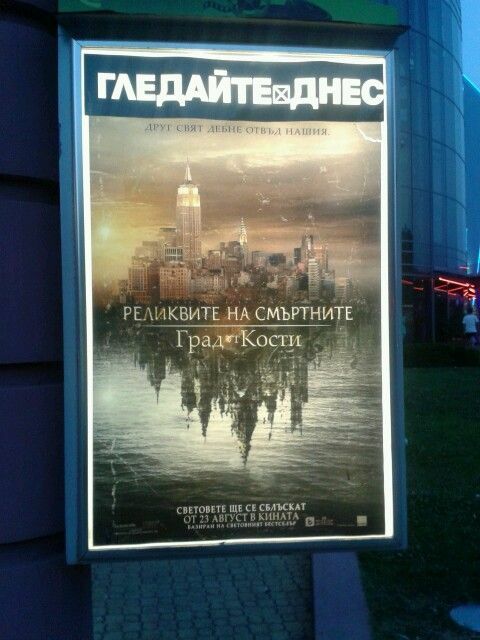 To celebrate its long-anticipated release, we have put together The Mortal Instruments: City of Bones movie posters or displays from all over the world. A huge thank you to all the great Shadowhunters that sent photos! If you have a photo from a country we haven’t yet listed in our gallery then comment below with a link. Thank you, I’ll add it! Reblogged this on YA on my Mind. Thank you, Sarah. I will add it. My photo, from Bulgaria! http://media-cache-ec0.pinimg.com/736x/e8/b2/8e/e8b28e885a7234a9292f67e215f5e5f1.jpg Just came back from the cinema, it’s amazing, guys! PS: Keep up the good work, love your site!